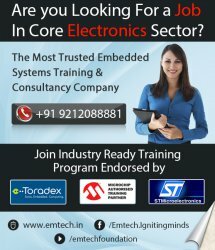 "EMTECH FOUNDATION is the most trusted certified Embedded System Training and Consultancy Company in India. We are an authorized training partner of Microchip Technology Inc., USA in India. EMTECH Foundation is a leading training solution provider for engineering students and graduates on various skills to meet the rising demand of Electronics Systems Design and Manufacturing (ESDM) in India. Opp. Metro Pillar no. 548, New Delhi – 110018 (INDIA)"